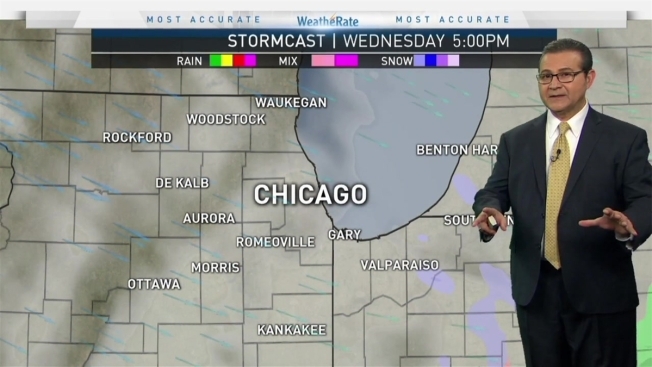 Winter weather continued across the Chicago area early Wednesday, with snow and freezing rain making for a difficult morning commute. Tuesday morning brought another winter system to the region, with snow, freezing ice and rain. A Winter Weather Advisory remained in effect through 12 p.m. for DuPage, Cook, La Salle, Kendall, De Kalb, Kane and Lake counties in Illinois as well. The area saw freezing drizzle turn into a mix of freezing rain and snow Tuesday evening, with snow accumulations up to 5 inches through Wednesday morning as well as ice accumulations up to a quarter of an inch in areas of De Kalb and Kane counties. Wednesday's precipitation was expected to end by late morning, for a mostly cloudy and breezy day, turning colder as temperatures quickly fall into the 20s.